Home > Water > Are Water-Efficient WCs Worth Installing? Flushing the toilet accounts for more than a third of all household water usage in the UK. An incredible 50 litres of water per person per day is washed away down the toilet - as much as most people drink in a whole month. But dual flush and low flush WCs can reduce household water use by a fifth; the most efficient WCs use less than 20 litres of water per person per day for flushing. Water shortages are a problem in some parts of Britain, and saving water can help protect birds and fish that live in rivers and wetlands. An added bonus is that less energy is be needed to treat water if less is being used. This leads to a reduction in the greenhouse gases that contribute to global warming. So when buying a new toilet get a water-saving low flush or dual flush one. Water-efficient WCs are specifically designed to clear the pan effectively with smaller flush volumes, and for those households with metered water the cost of fitting one can be recouped in two to four years, depending on the size of the household and local water and sewerage charges. All new toilets must flush with no more than six litres to meet Government regulations, and with dual flush cisterns the lesser flush should use no more than two-thirds of the full flush. Before 2001, all of the UK's domestic WCs had to use a siphon flush, but now approved valve mechanisms can provide an alternative. The siphon flush mechanism is leak-free, robust and requires little maintenance, whereas even the best valve flush mechanisms must be carefully monitored to ensure they do not jam or leak. Valve mechanisms do offer a number of advantages, such as fast flushing, an easily distinguished and more elegant dual flush operation, and a delay to the cistern refill that can save water. They will eventually leak, however. Regulations require endurance testing of 200,000 flushes - the equivalent of 20 years' domestic use - but if mechanisms are incorrectly installed and debris enters the cistern during installation, it can cause immediate leakage. 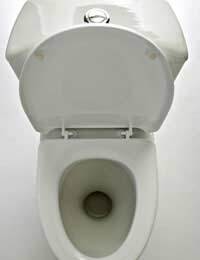 If replacing the toilet is not an option, older WCs can be modified to reduce the amount of water used for each flush. A water displacement device in the cistern will reduce the volume of each flush - typically by one or two litres. Various types of these devices are available from local water companies, but the same result can be achieved by filling a plastic bottle with water and placing it in the cistern. Before and after fitting a water displacement device, check that the flush works well, that the inlet valve does not leak and that it is adjusted so that the water is up to the level marked in the cistern. If double flushing is required, water usage could actually increase, so if there are problems with flushing it is better to remove the displacement device. Lowering the water level in the cistern will reduce the flush volume too, but this will also reduce the efficiency of the flush. It is also possible to fit variable flush devices to existing toilets. Many local water companies offer these retrofitting flushing devices.